Yes, I'm still dragging out my Daiso goodies. I told you there were a lot. I'm try to space them out, post wise, so you don't get too overloaded. One of the things I was really hoping to find was a konjac sponge. I read an article last year about them, and I figured this would be the big Asian import for 2014. Looks like I was right, because tons of companies have come out with their own versions. 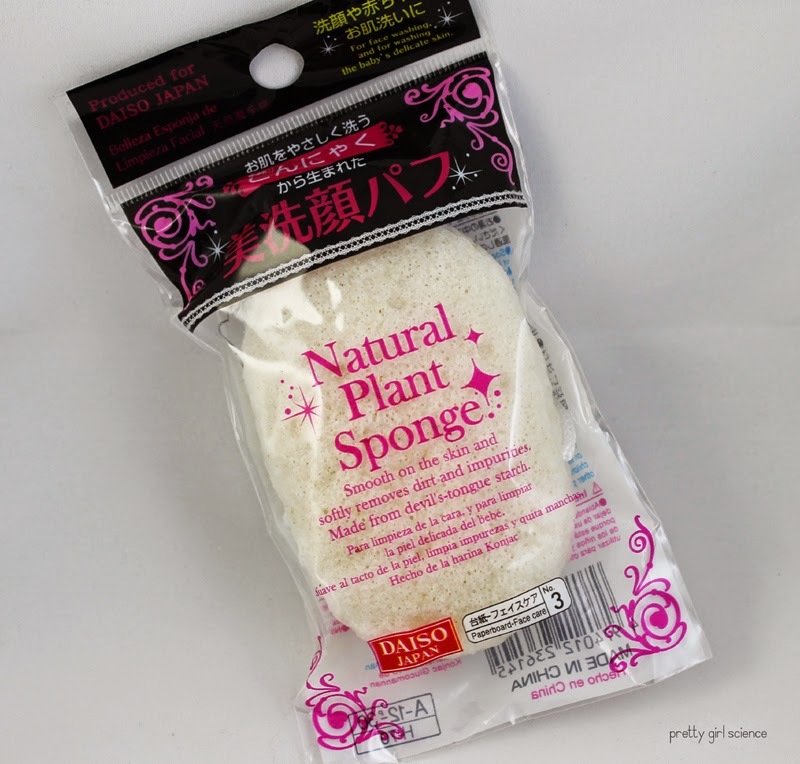 I really didn't want to spend close to $20 for the Boscia one, so I was very glad to spy this "Natural Plant Sponge" at Daiso. 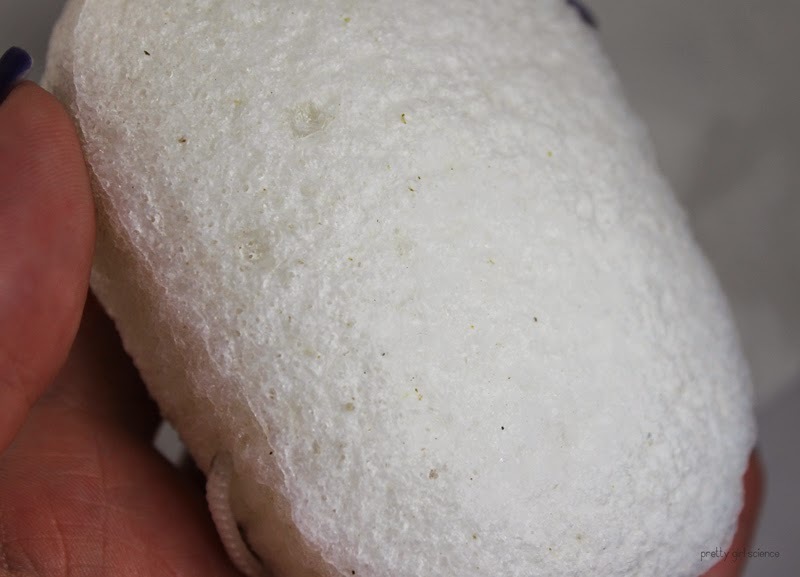 I'm guessing that it is, in fact, a konjac sponge. I think I may need to make monthly trips up there, just for random things like this. 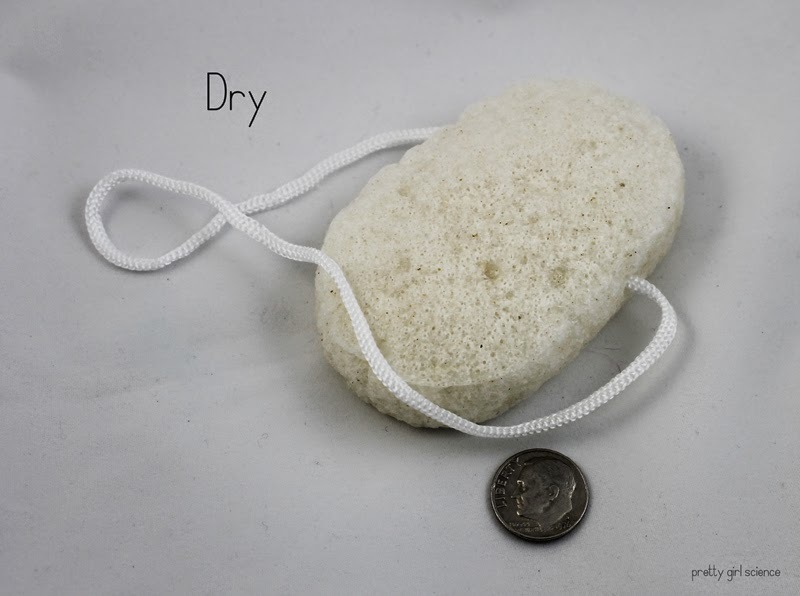 When you first remove this sponge from the packaging, it feels a bit like a pumice stone. Its hard, rough to the touch, and far lighter than you expect it to be. It despite the rough texture, it still feels pretty slick somehow, like it was polished a bit. 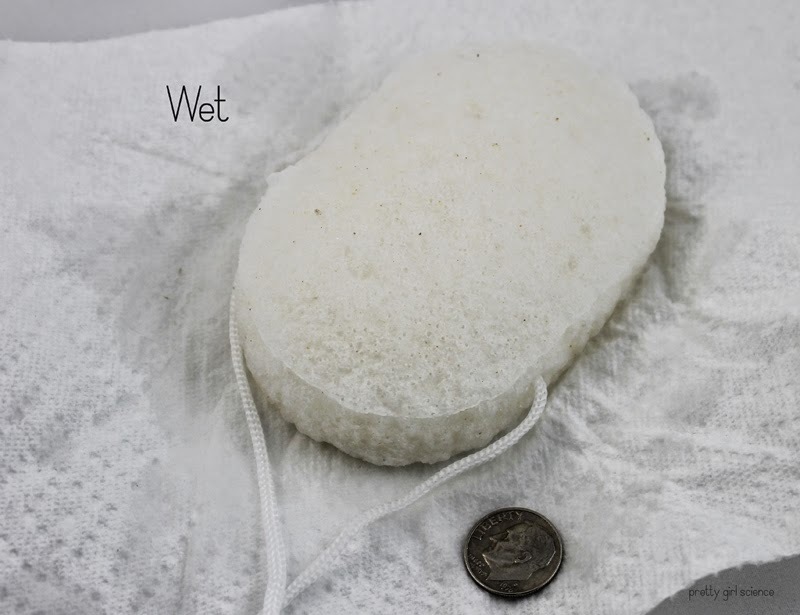 Once you soak it in water, it expands significantly and becomes soft and smooth. So smooth, you will wonder how it could possibly exfoliate anything at all. There is also a lot of bubbling going on, but I don't think its because it has anything in it or retains any soaps. I think, because it has so many little pockets of air, that it literally aerates whatever product you put on it. 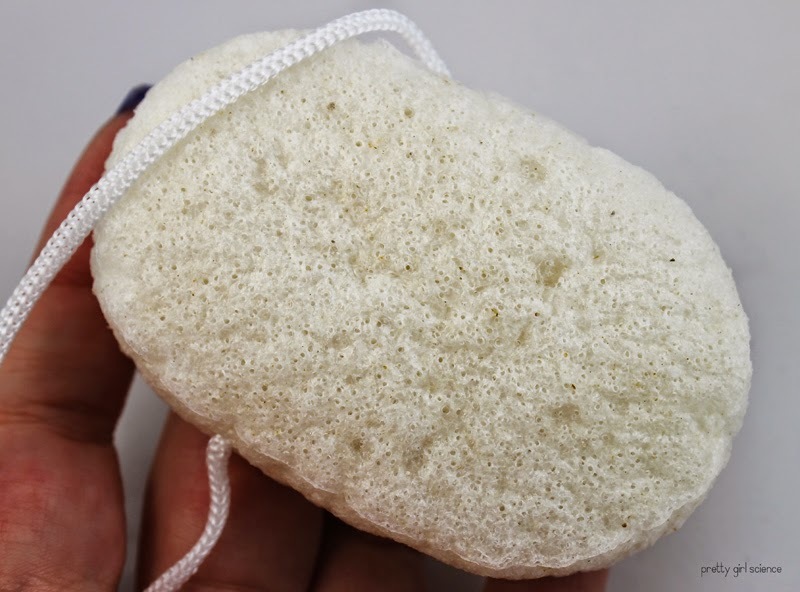 I used my Cerave non-foamy cleanser, and there were still bubbles coming out when I squeezed the sponge. That stuff definitely does not foam, no matter what you do. The upside is you wont need as much product to get the same bubbly effect...the downside is you will rinse this thing far longer than is actually required. When I was a young girl, my aunt bought me a Buff Puff. I was so excited to use it. 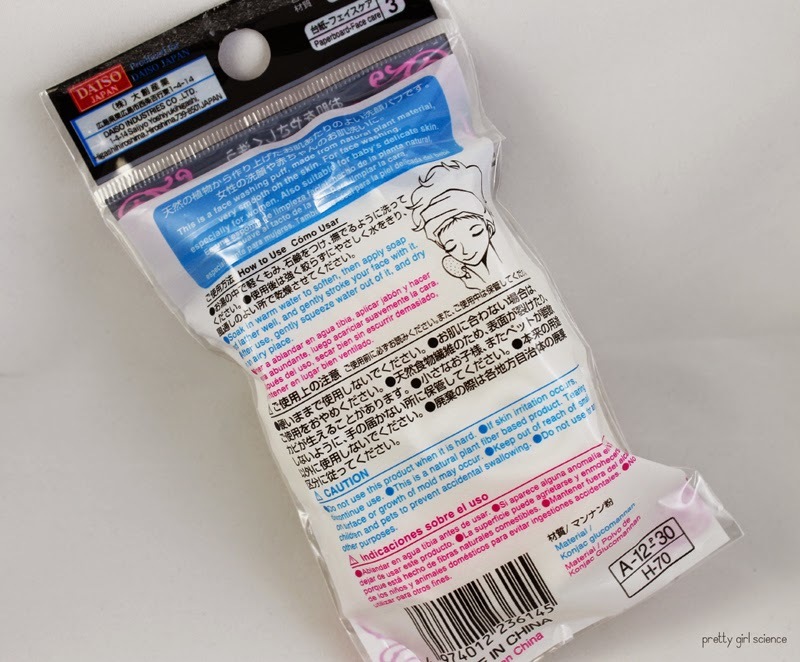 I thought it would give me perfect and flawless skin. Oh god, was I misled! 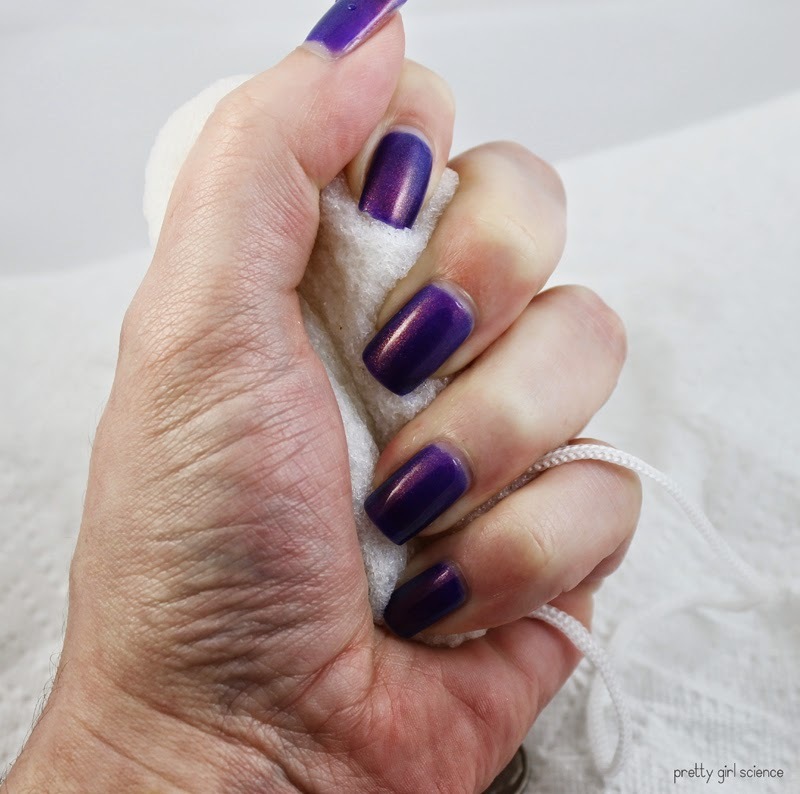 My (unbeknownst-to-me-at-that-time) overly sensitive skin revolted violently. I was red and itchy for quite a few days afterwards, to the point where my mom slathered me in aloe vera. I had been pretty gentle with it too, but my face just couldn't handle it. (Btw, if I was smarter, I would have learned a lesson here and saved myself a decade of misery. I am not smarter.) This particular experience has given me a little...healthy skepticism when it comes to exfoliation products...meaning I am slightly terrified of them. Once I finally got around to trying this on my face, I was pleasantly surprised. The weird combo of smooth and rough exfoliated and cleansed my skin pretty gently. I did experience a little dryness afterwards, but I expected that, because my skin does not approve of manual exfoliation these days. I also tried this on my neck, chest and arms...which are far less grouchy than my face. I really like how it works as a body sponge. My skin feels clean and smooth, but not tight and itchy. I may not use this for my face, but I will definitely use it for the rest of my skin.